Olympics Tickets go on Sale. Responses from the SMJ’s ..
With the tickets for the 2012 Games going on sale last week, the SMJ’s were asked to comment on what they thought about the Games in general and whether they themselves or any of their family and friends were going to buy any tickets? My name is Nathan Hanson, I am a 15 year old amateur athlete from Hackney and I go to Islington Arts and Media School and blog my thoughts and feeling about matters like the Olympics on my blog. To me the Olympics is a showcase of the world’s finest sporting talent, and the pinnacle of any athlete’s career. The event I look forward to the most is the men’s 200m final because the 200m is my favourite distance to run and to watch and I want to see how low Usain Bolt can take the world record. I do not actually know anyone who has requested Olympic tickets however I may try to get some for the sprint heats but I will watch the later rounds and finals at home because the tickets seem to expensive for something I can watch on the TV for free and I enjoy watching the race analysis on BBC especially from a legend like Michael Johnson. Hi, I’m Joe, 16, from Hackney and live a 10 minute walk from the London Olympics Stadium. I write a blog about how young people in London like myself can get involved in the 2012 Games. I also research and write about issues in my area that have some link to the games. I show lots of my sport photography on it too which is a key interest for me. For me the Olympics means the coming together of nations and cultures and the world looking upon your city. The thrilling unexpected news and action of the sport makes it even more exciting and I think that the cycling and swimming will be most fun to watch and experience. They are Britain’s most likely events to win golds in. My family and I have requested to become volunteers for the games to really capture the full experience of the games and maybe get free tickets or cheaper tickets as a result. The ticket prices are way too much to even think about paying for however I am and will find ways to experience the games as much as possible without paying for a seat in a stadium! My friends feel similar about the ticket price issue however they also are requesting to become volunteers and a couple of my friends are ambassadors for the games and are experiencing tours around the stadium and straight, up front news on issues in and around the Olympic site and new ideas on how to make the 2012 games in London even better. Hey my names Jake Morgan-Stead, I’m 16 . I live in Stoke Newington and go to Stoke Newington School & Sixth Form. I see the Olympics as a wonderful thing, both as an event in itself and also because of the long term possibility it gives to the East End of London, my home, of gaining investment and regeneration. I still think that the word ‘possibility’ in that last sentence is key though, whilst I may be positive about the games I know that some of my peers certainly aren’t and maybe with good reason. They argue that they would’ve rather seen the money spent on public services. My family and I have signed up for tickets, although I’m still pretty unclear about what deal I am likely to get; we won’t be able to afford to visit anything if they intend to charge a family of five more than about £40 each, which is still a large amount of money. To me one of the big tests of the games success will be the number of average Londoners who get to see the big events. After all it is us who will remember the games for the rest of our lives and so it’s important that it is not just those who can afford to pay high ticket prices that get to experience the games first hand. I’m Sonia, One of the 9 members of the Social Media Journalists on the Headstart Programme by A New Direction., I am also an Olympics Ambassador for my local borough which is Redbridge, it is an insight into working with the local authority in making sure these events are signposted in all areas and local people will be an active part in contributing to this effect. From a Young person’s perspective, The Olympics mean a chance for the world to look at the amazing infrastructure and regeneration done to London since we were given the bid to host the games in 2005; I think that this would mean a greater chance for different countries to see how the capital used funding and its spaces properly. The Olympics will bring about a positive change to the people and the area once the games come to an end, it will mean the poorer areas of East London will be given a glance whilst this spectacular event significantly improves the site and the views of many people. It has given London and myself as an individual something to look forward upon, and the excitement exceeds as tickets go on sale next week. I have signed up to the, regular newsletter for the 2012 Olympics which I receive on an update for the games. It has given me the first chance to register my interest for when the ticket spots open early next week. I am looking forward in placing my interest for the games and attaining a ticket for this event after working hard with Headstart and looking at the legacy from a Young persons perspective, although no one in my family has applied or registered their interest in tickets, it may need some persuading as ticket prices are anything from £20 to £2,012 which is quite a lot of money and in consideration to this, young people should be given some sort of an offer or a concessionary price. Those that live in East London should also be given first priority as they live and work around how the Olympics will change people’s views and poorer parts of East London altogether. As a young citizen of the UK, I would expect tickets to be of a slightly lower cost and anyone assisting in bringing a change or working on a project for the Olympics should be given a priority in attaining tickets for themselves as well as someone in their family, by doing this it will bring about more people to purchase or work to something they have achieved, the same approach in my view can be done for the Volunteers who are giving up their time to be there at the games next year. My name is Kimberley Nyamhondera. I am 16 years old and I live in Hackney and am currently attending Stoke Newington School. A year ago I went to Vancouver during the Paralympics to blog from a young persons perspective about the games. From there I continued blogging about the 2012 games speaking from a young person living in a host borough. To me, the Olympics is an opportunity for young people to get involved in extra activities around their area and help stage the event. I’d like to see the athletics, rowing and diving. My whole family have signed up for tickets but I think the tickets are way too expensive. I also doubt my whole family will be able to go. I don’t think my friends are aware that the tickets go on sale on the 15th but I know that the idea of paying for tickets is putting them off especially after they had their heart set on being volunteers but found out they were too young. My names Miranda Williams, I’m 16 years old, I live in Islington and I currently attend Islington Arts and Media School of Creativity. You can also have a look at my blog at mirandanews.tumblr.com.To me the Olympics is about using sport, something everyone can relate to, even if it’s just knowing someone who enjoys sport, to unite the world. I think I’m looking forward to the 100 metre sprints, because like everybody else, I’m waiting to see how Usain Bolt fares. I’m also looking forward to the swimming, because I love swimming myself.My family and I haven’t attempted to get any tickets to the Olympics, but some of my friends have and are planning to attend some of the events.The prices for the main events, such as the 100 metre sprints finals seem to be really high, so that would definitely put me off buying tickets for that event, if I was to buy tickets to some of the Olympic events, but some event prices don’t seem to high, so I wouldn’t mind buying tickets to them. Despite living in an Olympics bough, the Olympics was as foreign as French to me. With little knowledge (or concern) about sports or the implications of the Olympics I honestly didn’t care what happened.Fast forward three months and I realise how incredibly ignorant I’ve been. Courtesy of A New Direction, I suddenly found myself submersed in Olympic affairs: past and present. What worries me is that not everyone has had an epiphany yet – including several of my friends which means they are unlikely to apply for tickets or actively want to get involved with the games. Despite my new found enthusiasm, I doubt me or any of my family will attend the games based on the vast amount of individuals registering for tickets and the biggest malignity: price. With speculations of price reaching mammoth amounts like 2012 there’s no chance of me or anyone I know getting a ticket.Personally, as a Londoner who has put up with disruptions like traffic, diverted public transport routes and occasional power cuts, I’m surprised I’m not going to get complimentary tickets. I probably sound like the average stereotype of a pessimistic teenager so here’s the good! On the other hand, I will admit the effect the new developments have had on the surrounding area. Its undeniable the amount of jobs the Olympics will bring and it would be extremely ignorant of me to say the disruptions outweigh the developments. To be frank, getting a ticket to the games would be nice but it’s not the biggest issue. The Olympic authority have guaranteed to put screens up in several public places for those who don’t manage to get their hands on tickets so i guess I’m going to have to adopt a ‘Chin up! Its not the end of the word!’ attitude. Yesterday they launched the programme and information about buying tickets for the London 2012 Games – prices, events, venues with a guide of how to buy and things to consider .. tickets available to buy from March 15th and April 26th.. 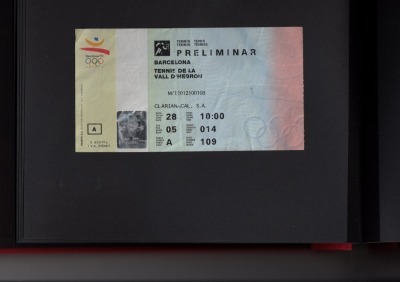 This reminded me that I’ve been meaning to post a picture of a ticket I still have from the tennis at Val D’Hebron from the Barcelona ‘92 Olympics.. I didn’t go to this, my flat mate at the time, Dani did – I am still looking for my men’s diving ticket final and the Dream Team…. The SMJ’s are due to interview Dani about his Barcelona Olympics and how it was to serve up food to The Dream Team Basketball team in the NBC cafeteria .. watch this space ..
Claudia got in their first reporting on the news that it’s looking very likely that West Ham will win the bid for the stadium after 2012; this is still pending the final decision from The Olympic Park Legacy Committee when they meet tomorrow. This is also very much in keeping with the focus of our Masterclass session on Saturday at A New Direction, which was all about the Olympic Park Legacy and what they the Social Media Journalists thought it should be .. The SMJ’s worked with regular visitor to A New Direction Guardian Journalist Benji Lanyardo. Benji gives them top writing and blogging tips and is encouraging them to add more texture to their blogs and to write their opinions .. they also worked with Multi Media Producer Chris Skinner, who helped them to flip video/ audio record/ and edit their pieces before embedding and posting..
All in all they are getting very professional. Their writing and attention to detail is really coming along and Joe who is also a talented photographer doubled up by taking some mug shots of the SMJ’s for the Headstart homepage – pics coming soon.. I wonder who will be the next to post? The SMJ’s are having dialogue with people from all over the world who lived in an Olympic City at the time of a Games.. This is an exciting opportunity, and interesting to hear people’s different experiences and feelings about such a big happening in their cities with a bit of hindsight .. This relates also to the two day conference I’ve just been attending held by Birkbeck University at the UEL campus in Stratford entitled ‘Learning From Barcelona: Art, Real Estate and The Pre-Olympic City’. There were lots of interesting speakers ranging from architects and artists, academics and writers to researchers and town planners looking back at the 1992 Olympic Games.. including Dr Beatriz Garcia who is an advisor to The International Olympics Committee (IOC) and to The 2012 Cultural Olympiad team..she has spent the last ten years examining the importance of the cultural context and hosting process of an Olympic Games and the relationships and tensions between all stakeholders .. Also speaking at the conference was Hackney based author Iain Sinclair on the impact of a Mega Event on its local borough and natural habitat and a place dear to his heart, Hackney …The conference asked what lessons we can take from the Barcelona’ Games in 1992 which re-positioned itself in the eyes of the world as a result of hosting the games .. London doesn’t need to position itself globally, so what does it want to achieve? and what learnings can we bring to London from other countries who have? ..The second day also included an unofficial tour of The Olympic Park led by Peter Coles – “Views from the Edge: A Walk Around the Perimeter of the Olympic Site” the whole event was very thought provoking and raised big questions about the tensions between who ‘owns’ the games and who owns the narrative of the games? How do you please the big, corporate stake holders, whilst simultaneously include local communities and traditions.. How do you let people own their own feelings of pride and celebration as well as present a unified front to the world .. How do local artists and families get involved and feel like a part of a whole? Time constraints and pressures and fast turn-arounds versus big questions around sustainability and the environment which were not even on anyone’s radar during the ‘92 games in Barcelona can cause serious problems .. though many things WERE done so beautifully and with a backdrop of sea and mountains to frame the four olympic points clearly marked out in the Catalan capital. I was there – I spent three glorious years in Barcelona between ‘91 and ‘94 and happened to be in exactly the right place at the right time for the ‘92 Olympics. Along with a group of friends, we witnessed the city change and surge towards Los Juegos Olympicos. We watched as Mariscal’s mascot Cobi became as familiar as Gaudi’s undulating architecture and the eyes of the world turned its attention to us .. I feel very proud of all the published blogs and content by the Headstart Social Media Journalists or SMJ’s as they are affectionately now known! .. Seems like all the hard work they’re all putting in is really paying off now – their blogs are beginning to look really professional and I think they all realise the power of their words ..There’s lots of really incisive thinking and creative content ranging from poems; Kim’s blog on Legacy ‘A Young Person’s Perspective’ and Kaspian’s specially composed piece of music to Kelan’s Haiku poem dedicated to Paralympian Gold Medallist swimmer Dervis Konuralp and everything else in between; great writing and razor sharp questions from Claudia, thought provoking stuff from Miranda about Peace One Day- the importance of The Truce and The Olympics, and Sonia’s first post about what Legacy will really be? – Joe’s amazing photo gallery plus interview with two Hackney Ambassadors and last but not least, Nathan’s film about What The Olympics means to his friends, family and to Dervis K – Bianca’s blog is great already and first official report and film is on its way! Sorry Benji – I know there are no links here – will get on to this tomorrow, promise!